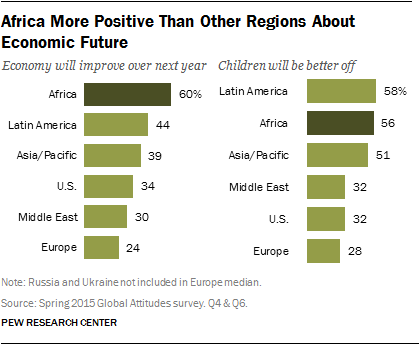 Sub-Saharan Africans are feeling positive about their current and long-term economic prospects compared with people in other regions of the world. 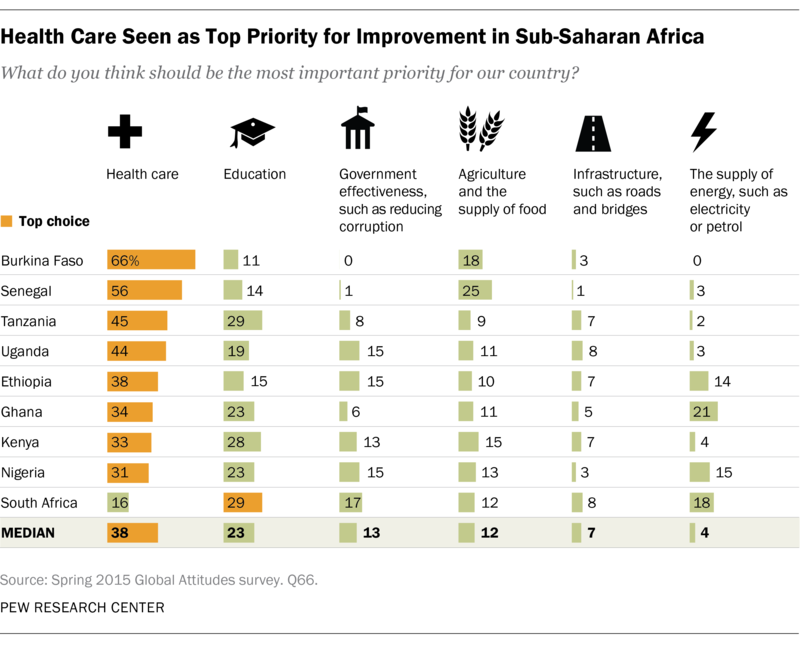 However, Africans still see the need for more foreign aid and are concerned about the serious challenges facing them, especially when it comes to better health care and jobs. This new snapshot of public opinion in nine African nations comes at a time when the United Nations is preparing to ratify new global goals that will shape the development agenda in Africa and elsewhere for the next 15 years. Africans’ views of their region’s development also come at a time when the U.S. and China are competing to be major players in Africa. Most in the region express favorable views of both countries – in fact, the U.S. and China are viewed more positively in Africa than in any other part of the world. 1 Although there is a pervasive gloominess about the state of the economy throughout much of the world, Africans are relatively positive about their short- and long-term economic future. Across the nine African nations polled, a median of 60% say they expect their country’s economy to improve over the next 12 months, the highest of any region. A median of 56% believe children in their country today will be financially better off than their parents, and about seven-in-ten or more hold this view in Nigeria, Ethiopia and Burkina Faso. 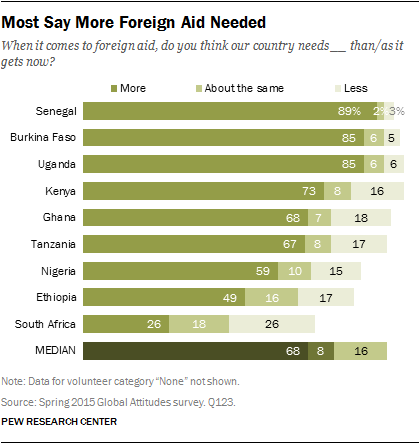 2 Nonetheless, most Africans (a median of 68%) say their countries need more foreign aid. More than eight-in-ten hold this opinion in Senegal, Burkina Faso and Uganda. South Africa, which has the highest per capita income among the nations surveyed, is an outlier on this question – just 26% of South Africans think their country needs more foreign aid. 3Africans continue to say their countries face a variety of challenges. Despite the optimism about the economic future, people still have many economic concerns – for instance, a median of 88% say the lack of employment opportunities is a very big problem. And when asked about six potential areas for improvement, beyond strictly economic issues, many identify health care and education as top priorities. Health care is the top choice in eight of nine countries, while education tops the list in South Africa. 4 In addition to domestic concerns, many in the region also are worried about global challenges, especially climate change. A median of 59% say they are very concerned about global climate change. 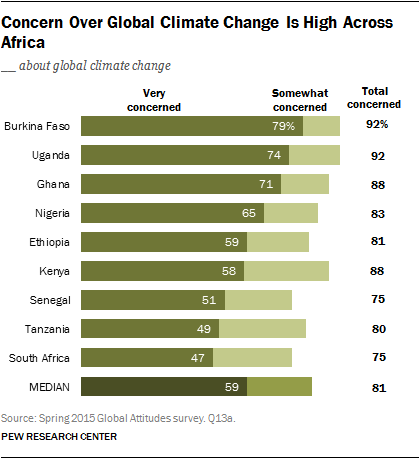 Among the seven global threats tested on the survey, climate change tops the list in seven of the nine African nations polled. Only Latin Americans express a similar level of concern about this issue. 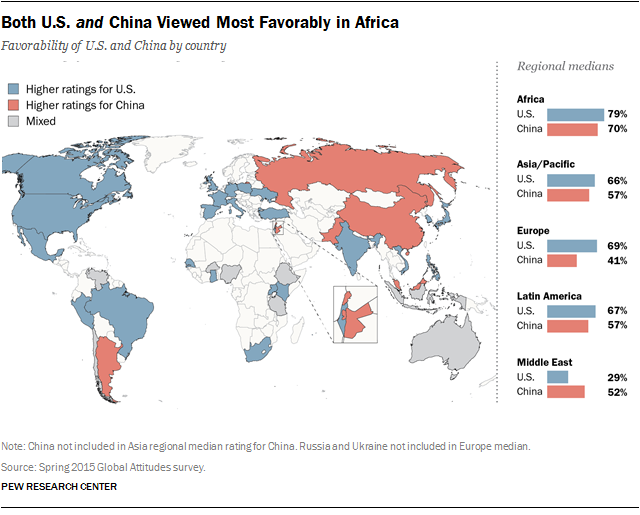 5At a time when China has increased its investment in the region, Africans give China mostly positive ratings. A median of 70% express a favorable view of China, making Africa the region of the world where China’s image is strongest. 6But the U.S. is even more popular in Africa. A median of 79% have a positive view of the U.S. A similarly high 77% express confidence in President Barack Obama to do the right thing in world affairs. America’s image in Africa has been consistently positive throughout more than a decade of Pew Research Center polling in the region. The rise in anti-Americanism that occurred in many parts of the world during the Bush era was largely absent in Africa.